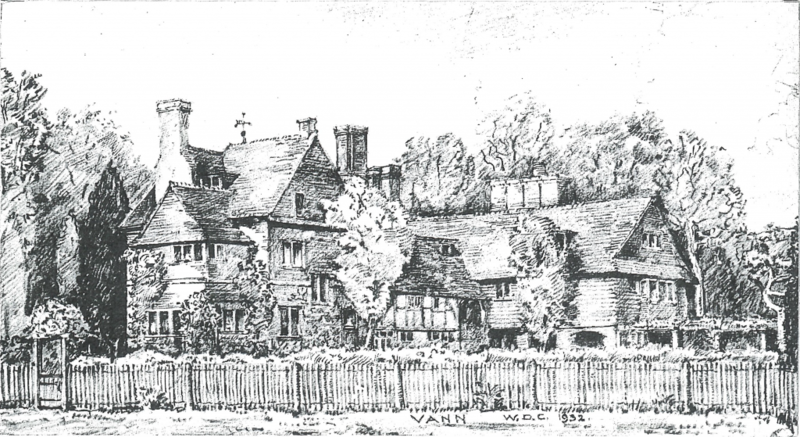 Vann can be traced back to the 12th century in the Godlaming Manorial Records. Spelt frequently Venne or Fenne, it means fen or bog and probably refers to a small hamlet on the wetland beneath the sandhills. The Caroe family have owned Vann for over 100 years. The house is steeped in history with additions to the original timber-framed 16th century house in every century, the most recent in 1907 by W.D.Caröe. Occupied in the 15th and 17th centuries by the mayors of Guildford, ownership has been traced from 1180 to the present day. The unique Water Garden by Gertrude Jekyll in 1911 links a succession of small ponds fed by the cascade from the quarter-acre pond, dredged in 2017, crossed by stone paths and bridges banked with lush vegetation and 1,500 water-loving plants supplied by Miss Jekyll from her Munstead nursery. The stream flows down to a wild White Garden, a blanket of snowdrops in February succeeded by narcissi, white fritillaries and martagon lilies, before disappearing into the coppiced woodland beyond. To the north, the stream enters the garden and runs through the Yew Walk (1909) in a rhyll banked by dry-stone Bargate walls and enclosed by large yew hedges radically reduced over the past three years. This formal “room”, originally a rose garden has been replanted with foliage plants and bulbs because of depredations by deer, to give year round interest. Island beds in the orchard allow for experiment with more “modern” plants. In the double mixed borders (created in 1992) in the vegetable garden, plants of special interest to the horticulturalist abound. Pears and peaches, recently replaced, fruit on the unusual crinkle-crankle wall. Both the house and garden are registered 2* by English Heritage.